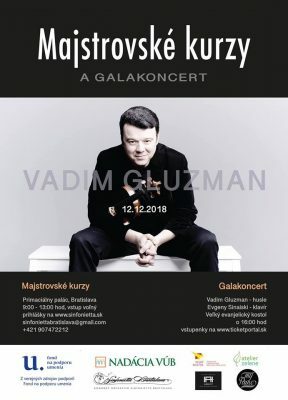 The violin recital of the world known violin virtuoso Vadim Gluzman takes place in the framework of the educational project „Masterclasses of world-known virtuosos in Bratislava“. At the concert Gluzman will introduce himself together with the outstanding pianist Evgeny Sinaiski, performing pieces from the world literature for violin and piano. Vadim Gluzman is an Israeli violinist with Ukrainian roots, he is often compared to the legendary David Oistrach. He can look back on cooperation with the most prominent orchestras of the world, as i. e. the Berlin Philharmonic, Boston Symphony, Chicago Symphony, Cleveland Orchestra, Israel Philharmonic, Leipzig Gewandhaus, London Symphony, Orchestre de Paris, Philadelphia Orchestra, Royal Concertgebouw. Vadim Gluzman plays an exclusive instrument from the workshop A. Stradivari „ex-Leopold Auer“ from the year 1690. The project is organized by the association Sinfonietta Bratislava and financially supported by the Slovak Arts Council and the VÚB foundation.